Popular Google-owned mapping app Waze was today updated with support for CarPlay on devices running iOS 12. The iOS 12 update allows third-party mapping apps to be used with CarPlay for the first time, providing an alternative to the built-in Apple Maps app. 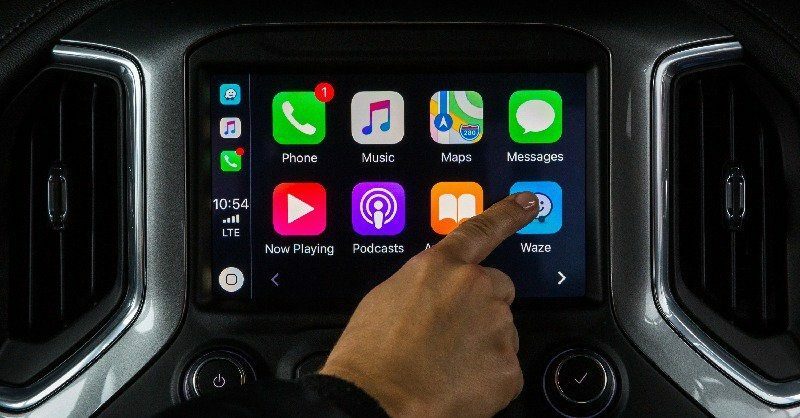 With CarPlay support, iPhone users who prefer to use Waze for mapping purposes can do so through the CarPlay interface, something that was not possible with iOS 11. Waze is a popular app because it provides detailed information on traffic, ongoing construction, crashes, and other issues that can result in travel delays. Google Maps, another popular Apple Maps alternative, was also updated with CarPlay support last week. Any pictures or videos of how it looks? The Apple Maps UI on CarPlay is horrendous - see my earlier post about that. I'm curious if Waze is a big improvement or not. Been using carplay for awhile and like it a lot, not sure what you are expecting a map to look like? Can someone explain to me how Waze is better than Google Maps? Anyone know why they didn’t include the speedometer on the app? I thought I turned it off on my phone but it’s on. I read somewhere that there are some limitations when connected to CarPlay. If that’s the case it’s a stupid move. I like Waze and really like the speedometer feature. Maybe a future update will allow it? Uggh - I don't want Waze on my radio screen, I like it on my phone. Even when I move the waze app off carplay, it still takes over my radio. Anyone know how to make it so waze won't use carplay? It's awful. [doublepost=1537944618][/doublepost]I agree, help ! I can't get the map back on the phone screen, only on head unit screen. Why not simply kill the app? I mean quit it...? Or do you háve to use waze while driving? Kinda would be strange to have Carplay and be able to use Waze without it. Settings / General / CarPlay / tap your car model and press the minus. Helps you avoid law enforcement. As others mention, it is crowd-sourced traffic information that will dynamically alter your route to take the shortest path around obstructions. It has pretty easy map editing to share your local knowledge around areas if you so choose, and also allows interaction, rankings, and social features with with other Wazers, but that is hardly required. Waze and other such services are a prime reason that back roads get deluged in traffic when there is an accident on a main road. Our area completely locked up with cars on secondary roads a year or so back. I'm still on the fence about smart traffic routing as local neighborhoods can get royally s***wed by the propeller heads and their location agnostic algorithms in such instances. But I digress. Is this your app? You link to it every time there is a CarPlay article. So I have a 2017 Honda Accord Touring that has built in navigation and car play. This weekend I tried to use Siri to look something up and hoped that it would just display navigation on my screen through Apple Maps but it didn't. Sure I can just type the address in myself, but this is 2018 dammit and I shouldn't have to. Is there a way to get navigation on my phone to display on my cars display? That way I can just be like Hey Siri take me to Burger King (or whatever) and just have it connect with my display instead of having to enter it in myself. I have a 2016 Honda Civic and I can use Siri with Apple Maps and CarPlay no problem, including pressing the button on my steering wheel and saying "get me direction to _________." What does not work, nor would I expect it to work (although it would be great if it did) would be to use the above method with 3rd party navigation apps as well. Google Maps sort of gets there by having a microphone button on their CarPlay UI but it is less convenient than using the button on the steering wheel AND you have to switch to the app (Google Maps) to use it. Using Apple Maps I can be in any CarPlay application (typically music), press the steering wheel button, and say "get me directions to ________" and it works. Do not know why support for a 2017 Accord would not be the same.